Also serving communities of Saint John, Saint John, Dyer, Whiting. There are 21 Assisted Living Facilities in the Schererville area, with 2 in Schererville and 19 nearby. The average cost of assisted living in Schererville is $4,600 per month. This is higher than the national median of $3,346. Cheaper nearby regions include Merrillville with an average starting cost of $2,497. To help you with your search, browse the 161 reviews below for assisted living facilities in Schererville. On average, consumers rate assisted living in Schererville 4.9 out of 5 stars. Better rated regions include Dolton with an average rating of 5.0 out of 5 stars. Caring.com has helped thousands of families find high-quality senior care. To speak with one of our Family Advisors about assisted living options and costs in Schererville, call (855) 863-8283. The town of Schererville is a Chicagoland suburb. It's been dubbed the “Crossroads of the Nation” for its location at the crossing of two major roadways, US 30 and US 41. Nearly 29,000 people reside in this town, about 18 percent of whom are aged 65 and over. There are over 20 assisted living facilities in the Schererville region, including two in the city proper and 19 more nearby. 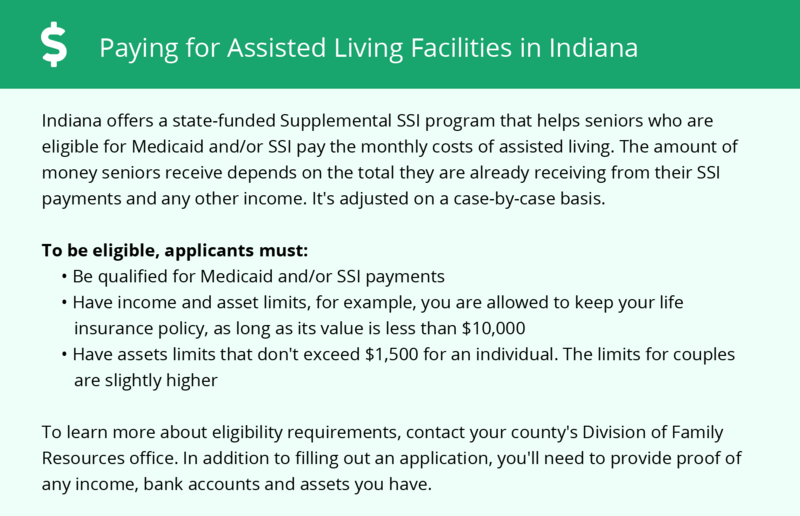 In Indiana, assisted living facilities are officially called residential care facilities and are licensed by the Family and Social Services Agency Division of Aging. Safety in Schererville is rated 74 out of 100, meaning that it's safer than 74 percent of all U.S. cities, and it has a lower crime rate than 66 percent of Indiana cities. Furthermore, when compared to similarly sized cities across the country, Schererville's crime rate was notably lower than other communities, making the city a good option for seniors who enjoy being active in the community. According to data gathered by the American Lung Association, ozone pollution and short-term particle pollution levels are very high in Schererville. Lake County was given an F for both types of pollution, which may impact the quality of life of retirees with respiratory or cardiovascular conditions. Indiana seniors pay state income tax on income from retirement accounts and pensions, but Social Security benefits are not taxed. The state has fairly low property taxes, which may benefit retirees who own property in Schererville. Schererville's overall cost of living is a little higher than the national average and about 20 percent higher than the state average. This is primarily due to the high cost of housing, which may affect seniors who rent or plan to purchase a home here. Groceries and healthcare expenses cost a little less here than in the nation as a whole, which may offset higher home costs. The Schererville area is home to world-class medical facilities, including Community Hospital Outpatient Center, in the event of medical emergencies or illness. Summers in Schererville are warm and humid with highs around 84 degrees, and winters are chilly with lows in the teens. The city's climate may be well-suited to seniors who enjoy experiencing four distinct seasons. Assisted Living costs in Schererville start around $4,600 per month on average, while the nationwide average cost of assisted living is $4,000 per month, according to the latest figures from Genworth’s Cost of Care Survey. It’s important to note that assisted living rates in Schererville and the surrounding suburbs can vary widely based on factors such as location, the level of care needed, apartment size and the types of amenities offered at each community. 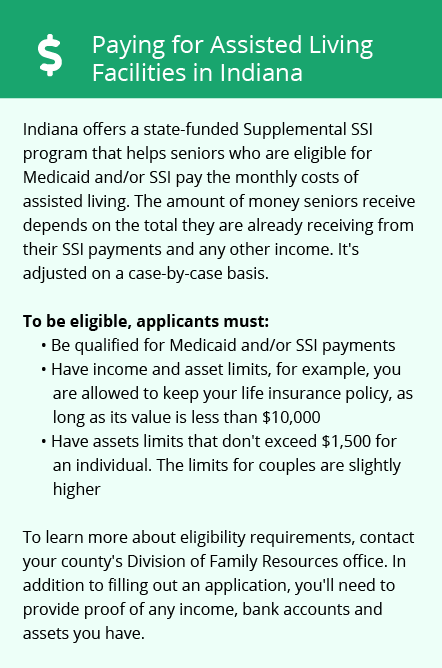 Low-income seniors in Schererville may qualify to receive financial assistance for assisted living through three programs, including Indiana Medicaid, the Medicaid Aged and Disabled 1915 (c) Waiver program and the Indiana Residential Care Assistance Program. Schererville and the surrounding area are home to numerous government agencies and non-profit organizations offering help for seniors searching for or currently residing in an assisted living community. These organizations can also provide assistance in a number of other eldercare services such as geriatric care management, elder law advice, estate planning, finding home care and health and wellness programs. To see a list of free assisted living resources in Schererville, please visit our Assisted Living in Indiana page. Schererville-area assisted living communities must adhere to the comprehensive set of state laws and regulations that all assisted living communities in Indiana are required to follow. Visit our Assisted Living in Indiana page for more information about these laws.